RNLI SEA SURVIVAL DIVER Best techniques for safe diving practice in UK seas. 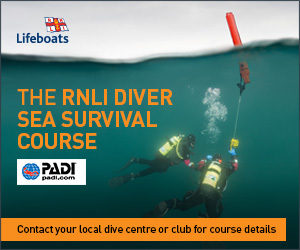 It's important to do this course to make sure your diving skills are compatible with the sea conditions that can be encountered around the UK. Accidents can happen but similar to PADI Rescue Diver this course will help you recognise & avoid any potential problems. We will cover everything from dive planning to how to call for help as well as how to increase your visibility on the surface, if you do need rescuing. You use all your basic scuba gear including a dive computer and accessories.You’ll also learn about some specialist equipment and practice using some it, such as a Surface marker Buoy. After completing the RNLI Sea Survival Diver, you should take the PADI Emergency Oxygen Provider course. Together, these two courses round out your ability to handle scuba diver emergencies.